Coconuts are produced in 92 countries worldwide on about more than 10 million hectares. Indonesia, Philippines and India account for almost 75% of world coconut production with Indonesia being the world’s largest coconut producer. A coconut plantation is analogous to energy crop plantations, however coconut plantations are a source of wide variety of products, in addition to energy. The current world production of coconuts has the potential to produce electricity, heat, fiberboards, organic fertilizer, animal feeds, fuel additives for cleaner emissions, health drinks, etc. The coconut fruit yields 40 % coconut husks containing 30 % fiber, with dust making up the rest. The chemical composition of coconut husks consists of cellulose, lignin, pyroligneous acid, gas, charcoal, tar, tannin, and potassium. Coconut dust has high lignin and cellulose content. The materials contained in the casing of coco dusts and coconut fibers are resistant to bacteria and fungi. Coconut husk and shells are an attractive biomass fuel and are also a good source of charcoal. The major advantage of using coconut biomass as a fuel is that coconut is a permanent crop and available round the year so there is constant whole year supply. Activated carbon manufactured from coconut shell is considered extremely effective for the removal of impurities in wastewater treatment processes. Coconut shell is an agricultural waste and is available in plentiful quantities throughout tropical countries worldwide. In many countries, coconut shell is subjected to open burning which contributes significantly to CO2 and methane emissions. Coconut shell is widely used for making charcoal. The traditional pit method of production has a charcoal yield of 25–30% of the dry weight of shells used. The charcoal produced by this method is of variable quality, and often contaminated with extraneous matter and soil. The smoke evolved from pit method is not only a nuisance but also a health hazard. The coconut shell has a high calorific value of 20.8MJ/kg and can be used to produce steam, energy-rich gases, bio-oil, biochar etc. It is to be noted that coconut shell and coconut husk are solid fuels and have the peculiarities and problems inherent in this kind of fuel. 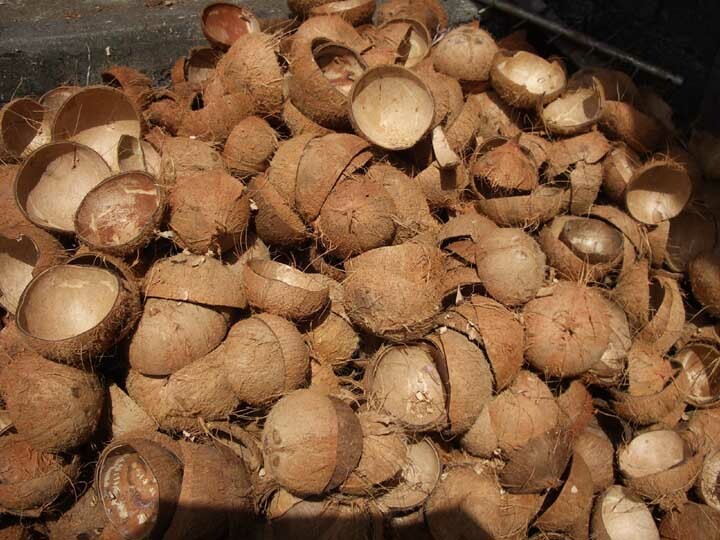 Coconut shell is more suitable for pyrolysis process as it contain lower ash content, high volatile matter content and available at a cheap cost. The higher fixed carbon content leads to the production to a high-quality solid residue which can be used as activated carbon in wastewater treatment. Coconut shell can be easily collected in places where coconut meat is traditionally used in food processing. Coconut husk has high amount of lignin and cellulose, and that is why it has a high calorific value of 18.62MJ/kg. The chemical composition of coconut husks consists of cellulose, lignin, pyroligneous acid, gas, charcoal, tar, tannin, and potassium. The predominant use of coconut husks is in direct combustion in order to make charcoal, otherwise husks are simply thrown away. Coconut husk can be transformed into a value-added fuel source which can replace wood and other traditional fuel sources. In terms of the availability and costs of coconut husks, they have good potential for use in power plants. There is a huge demand for charcoal briquettes in the Middle East, especially in Saudi Arabia, Egypt and UAE. However the production of charcoal is in nascent stages despite the availability of biomass resources, especially date palm biomass. The key reason for increasing demand of charcoal briquettes is the large consumption of meat in the region which uses charcoal briquettes as fuel for barbecue, outdoor grills and related activities. The raw materials for charcoal briquette production are widely available across the Middle East in the form of date palm biomass, crop wastes and woody biomass. With a population of date palm trees of 84 million or 70% of the world’s population, the potential biomass waste from date palm trees is estimated at 730,000 tons / year (approximately 200,000 tons from Saudi Arabia and 300,000 tons from Egypt). Date palm trees produce huge amount of agricultural wastes in the form of dry leaves, stems, pits, seeds etc. A typical date tree can generate as much as 20 kilograms of dry leaves per annum while date pits account for almost 10 percent of date fruits. The fronds and trunks of date palm trees are potential raw materials for charcoal because of the potential to produce high calorific value and low ash content charcoal. Leaf waste will produce a low calorific value due to high ash content. In addition, woody biomass waste such as cotton stalks that are widely available in Egypt can also be a raw material for making charcoal. The contribution of the agricultural sector in Egypt is quite high at 13.4%. Charcoal is compacted into briquettes for ease in handling, packaging, transportation and use. Briquettes can be made in different shapes such as oval, hexagonal, cube, cylinder or octagonal. An adhesive (called binder) is needed for the manufacture of the briquette. Two common binders are saw dust and corn starch. Continuous pyrolysis is the best technology for charcoal production. Continuous pyrolysis has the ability to handle large biomass volumes, the process is fast and smoke production is negligible. When using conventional pyrolysis technology (or batch carbonization), the process is lengthy, processing capacity is small and there are concerns related to harmful smoke emissions. Apart from charcoal, continuous pyrolysis also gives bio oil, wood vinegar and syngas. Syngas can be converted into electricity by using a gas engine or converted into a wide variety of biofuels through different processes. Bio oil can be used as boiler fuel and marine fuel. Wood vinegar can be used as biopesticide and liquid organic fertilizer. Low water content in date palm waste fronds and trunks make it very suitable for thermochemical conversion technologies, especially pyrolysis and gasification. Charcoal can also be used for the production of activated charcoal/carbon. Activated carbon is used by a lot of industries for purification processes. In addition, a number of industries that are using petcoke as fuel can switch to charcoal due to its better combustion properties and eco-friendly nature.